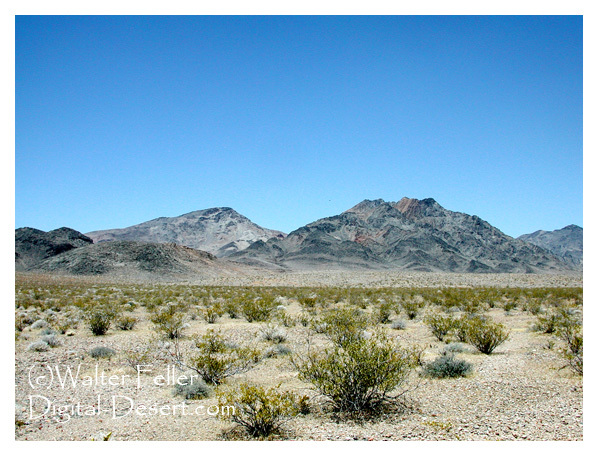 NATURAL RESOURCES: The wilderness is dominated by the Nopah Range for which it is named. The Chicago Valley, flat with many winding, light-colored washes, is a north-south divide in this wilderness, with part of the Resting Spring Range to the west and the Nopah Range to the east. Both ranges are rugged and exhibit dramatic geologic landscape. Elevations range from 1,800 feet and rise 6,395 feet to the summit of Nopah Peak. Mountains, alluvial fans, badlands, playas, plains, washes and hills unfold in harmony here. Creosote bush scrub cacti, yucca and other desert shrub species cover the bajadas, giving the mountains their barren character. Bighorn sheep, desert tortoise, golden eagle and prairie falcon all enjoy the habitat provided by the Nopah Range, while wild horses and burros can be found roaming the Chicago Valley. ACCESS: Access this wilderness from State Highway 178 or the Old Spanish Trail Highway.